It’s a joy to be able to serve the Lord as pastor here at Calvary! It wasn’t my plan, my idea, or my objective; but I’m thankful for the way the Holy Spirit redirected me and brought me to this place. I grew up south of Baltimore in Anne Arundel County, Maryland, with my mom, dad, older sister, and younger brother. My parents faithfully took us to church every week. They sent me to a Christian elementary school. I learned a lot about the Bible, but beginning in my teenage years, I began to live life my own way. The truth I knew didn’t affect the way I chose to live. I was a rebel. When I left home to go to college, I left many moral barriers behind. It seemed fun, but left me empty. I knew something was wrong. I reasoned that my choice of friends had led me down the wrong path, so I transferred to a different school after my first year. I was fine for a few months, but then I got bored and decided to join a fraternity. In just a few short months, I was worse than before. It was a crazy lifestyle. One good thing that came out of my time there was that I met my wife, Susan. My life changed when Susan’s dad called one day. I’ll never forget it. He was broken and weeping. He had just discovered that his wife had cancer throughout her body. When Susan heard the news we quickly gathered some things to head to her parents’ house in New Jersey. In that moment, I remembered that the Bible was God’s word. We grabbed a Bible and began to read, looking for hope. Over the next several months, we read the Bible and listened to radio Bible teaching. I discovered life-changing, impacting truth in God’s Word. Through the process of digging into the Bible seeking answers, both Susan and I individually entered into a relationship with Jesus Christ as personal Lord and Savior, surrendering our lives to Him. We were married in June of 1989. In July of the following year (1990) we had our first child. The Lord has blessed us with five children—two boys and three girls. As we sought the Lord, we longed for a fellowship centered on God’s word. We heard expositional teaching on the radio and loved it; we wondered, “Why doesn’t a church simply teach the Bible?” We spent years searching for a fellowship. Then through a series of events, the Lord eventually led us to a Calvary Chapel. The pastor was teaching through Daniel, line by line, verse by verse. We couldn’t get enough! I sensed a call on my life, but didn’t know the details. I thought we were going to be missionaries in a foreign country and we began to prepare to go. While waiting for more direction, we began to serve any way we could at Calvary—from helping set up for services, to watching toddlers; from teaching Sunday School to teaching new believers; from leading home Bible studies to serving on the Board. It was a joy to help. I was praying diligently, seeking for direction and where to begin to teach a Bible study next. Then one evening I met a few young men who had made the journey from Delta to Calvary for the mid-week Bible Study. Knowing they had traveled quite a distance, I asked if they had ever considered having a home Bible study. They said they had and had been praying for someone to teach one. I went to the pastor, we prayed, and sensed the Lord opening a door to minister to those who were driving from Delta for church. The first Sunday evening we met, 12 people gathered for prayer. The next week, 20 people gathered for the first Bible study. After a few months, 50 people were gathering weekly to worship and study God’s word. That was the summer of 1996. Then in November, I was ordained and sent with Calvary’s blessing to start Sunday morning services in Delta. Subsequently, I went through the affiliation process and was approved to become a part of Calvary Chapel Outreach Fellowships (an association of Calvary Chapel ministries throughout the world). As I’ve been teaching through the entire Bible, verse by verse, it’s been amazing to watch the Holy Spirit work. I’ve been encouraged to see what the Lord does through the simple teaching of His word. Over the years, we’ve been blessed to see lives radically transformed, coming to faith in Christ, equipped for ministry, and sent into the world to represent Him. God, by His grace, has enabled us to be involved in missions around the world, including the blessing of being able to start and maintain a child sponsorship program in the Dominican Republic and, from that ministry, establishing a church in the Dominican Republic. Above all, I am thankful to be saved, to be a child of the living God. I’m thankful for my faithful wife who loves Jesus, educates our children at home and supports and enables me practically to serve the Lord. I’m thankful for the privilege of being a parent, and for the joy of watching the Lord work in my children’s lives. I enjoy running, lifting weights, exercising with my family, and I’m a big fan of my children’s sports teams. It’s been a wonderful journey, so far! I’m looking forward to what the Lord will continue to do as we wait for His return. I’m determined to continue teaching through the WORD, trusting the Holy Spirit to work and to accomplish the Lord’s purpose in our community! 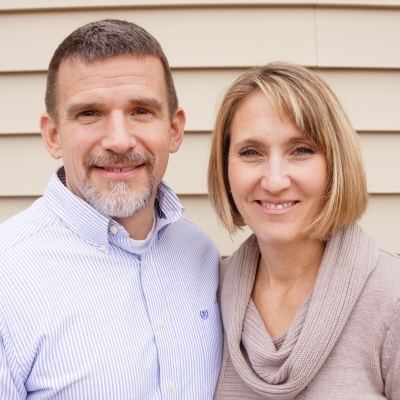 Doug & Susan serve together as part of the Pastoral Care Team.